With spectacular firework displays around the world from Sydney to Paris all vying for the best in festivities, here are a few odd traditions that make these places really stand out. Throwing Things out the Window – In Puerto Rico, individuals walk throughout their home with a bucket of water in the hopes of collecting any bad spirits or energy. They then throw the water out the window. In Italy and South Africa, they have a more dramatic approach by throwing out pots, pans, furniture, and appliances. Hopefully, no one is hit in the head or injured! 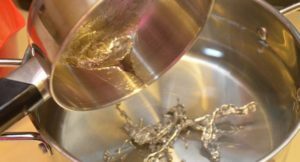 Reading the Future with Molten Metal – Nordic countries like Finland, Austria, and Germany use the ancient tradition of molybdomancy – where tin is melted over a flame. It is then submerged in cold water solidifying into strange shapes. The mysterious shapes are then studied to determine what the coming year holds in store for them. Wearing the Right Colored Underwear – A typical Latin American tradition to influence the new year is wearing a particular color. For instance, red (which is also used in Spain and Italy) signifies a desire for luck in love, while yellow is for prosperity. In Brazil, white represents good luck for the coming year which is compounded by jumping into the sea and jumping over seven waves while making New Year’s wishes. Eating Grapes – In Spain at midnight, a total of twelve grapes are eaten – each one corresponding with a wish and each one to be eaten at each stroke of the clock. Some Latin American countries do this as well including Mexico. It’s a bit challenging! First Foot Through the Door – In Scotland people take this tradition very seriously especially since they celebrate Hogmanay (New Year’s) in a big way. 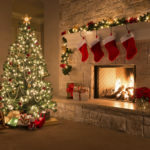 This means that the first guest who enters their home in the New Year is supposed to bring gifts such as food and whiskey to bring prosperity and luck. In Greece, one must step into the home with the right food to signify a blessed year ahead.